Sarnia, ON – MacKenzie Entwistle (Hamilton Bulldogs) buried a penalty shot and Barrett Hayton (Sault Ste. Marie Greyhounds) scored a highlight reel goal to lead Team OHL to a 3-1 win over Russia in Sarnia. 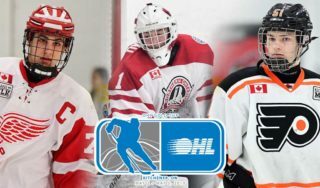 The CHL takes a 6-3 series lead in points headed into the weekend as Isaac Ratcliffe (Guelph Storm) also scored and goaltender Michael DiPietro (Windsor Spitfires) stopped 18 of the 19 shots he faced. The OHL didn’t waste any time taking the lead as Ratcliffe scored on the team’s first shot of the game. Hayton won a puck battle along the boards, centering for an oncoming Ratcliffe who entered the zone with speed before reeling the puck in and snapping it past Russia’s Daniil Tarasov 4:55 into action. Entwistle extended the OHL lead on a penalty shot with 1:55 left in the opening frame. After being hooked on a breakaway, the Chicago Blackhawks made good on his second attempt, snapping a quick release over the blocker of Tarasov. It’s the OHL’s second penalty shot goal in as many years after Taylor Raddysh converted in Hamilton. Russia kept things interesting before the end of the period though as captain Pavel Shen scored his second of the series alone in the slot with 43 seconds left on the clock. Stepan Starkov centred for Shen who had time and space to lift a quick release over the shoulder of DiPietro, sending things to the first intermission with the OHL leading 2-1. After just seven combined shots in the first the two teams opened things up in the second as goaltenders DiPietro and Tarasov were tested more regularly. Hayton continued his strong showing, scoring the goal of the series to this point when he walked over the blue line, turning a Russian defender inside out before patiently tucking a move to the backhand past Tarasov midway through the period. Team @OHLHockey takes a 3-1 win in Game 3 of @CIBC #CANvsRUS ?? 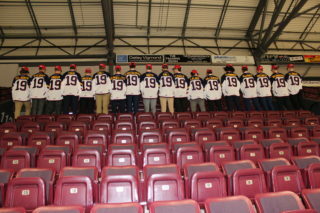 @OHLHoundPower forward @BarrettHayton leads the way with 1G, 1A. A pair of big third period saves from DiPietro maintained the OHL lead as they’d lock down the 3-1 decision for a fourth straight victory in Sarnia dating back to 2003. Team OHL outshot Russia 23-19, doing so for the 14th straight game dating back to November 14th, 2011. The OHL improves to 25-5-1 in the CIBC Canada Russia Series, winning its first Game 3 matchup since 2015. Game 4 of the CIBC Canada Russia Series is set for Monday November 12th in Oshawa. See the action on Sportsnet beginning at 7 ET/4PT.